I’m one who favours defending square and with coordination being more important than quickness. This ensures integrity of the line, without anyone rushing ahead of another or having to rely too heavily on a team mate. Staying square means you can defend off either shoulder and make easy adjustments as attacking players do. Most, if not all, of the attack solutions found in the Drift and Blitz defence posts can be used against flat, man-on-man defences. In some of the video examples, you can see how teams started square, but then had to resort to a drift, otherwise turned their bodies to chase an attacker, or one player shot up ahead of his / lagged behind team mates. With coordination and trust being vital to effective defence, attackers should consider ways to break this and find opportunities for themselves or their support runners. This doesn’t require fancy, multi-faceted moves with decoy runners. It can be done with a simple dummy pass and/or sudden change of direction. I don’t know if there’s a ‘non-negotiable’ rule for any of these, but players should be trying these things out in training in natural 4v4 games in realistic conditions so they can work out what works for them. Some key reminders should be to keep the ball in two hands to always remain a threat, to keep changes of direction sudden and sharp, to aim for shoulders to draw attention. I figure if one of the greatest fly halves of all time can say that, then certainly decision makers at every level should be demanding more from their support. The decision-maker’s arguably more different task given that he won’t have a Will Greenwood outside him/her is to know what angles, dummy passes, decoy runners, etc. do to defences, quickly consider the advice, and pick the best option for what he/she sees in front. It’s another reason I think we need to play more realistic games at training, because this is rugby. Training against passive defenders – or no defenders at all! – will not allow players to develop these skills. And I challenge all my players, from props to full backs, to be able to step into that position and make a good decision based on what they see and hear. 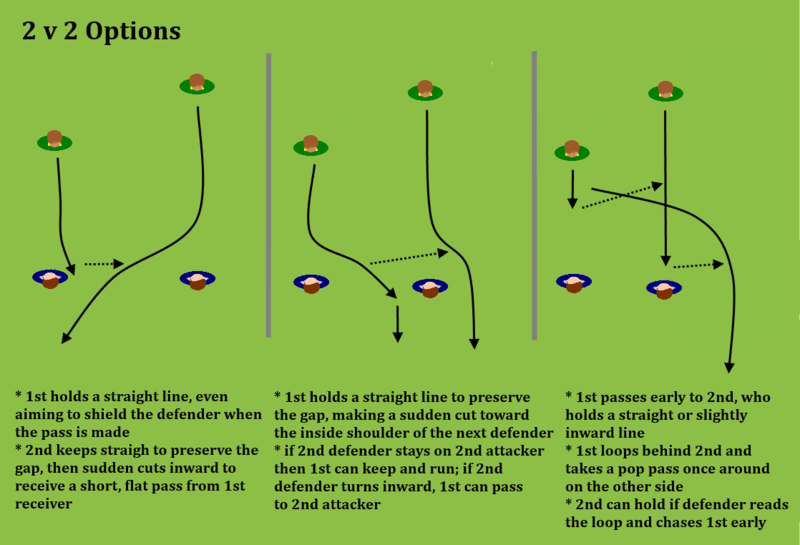 The first is an example of a classic Unders Line, where it’s important that the ball carrier stays straight, to fix the defender, and that the supporting runner’s directional change is sudden and sharp. If the defender covering the ball carrier is properly fixed, the strike runner can aim for the space behind his shoulder, ensuring that he gets away from the man covering him. The Overs Line is pretty much the opposite, with the strike runner flaring outward instead of inward, aiming for the space behind the third defender or off the shoulder of his if he’s turned inward. Of course, the pass is different for each – soft and flat for an Unders, and hard and wide (maybe slightly deep, but definitely in front of the runner’s hands). The second example is often called a Y-Line these days, with the ball carrier making the sudden move. He aims for the space behind the defender beside the defender covering him. This sudden and sharp angle either allows him to slip behind that defender or draw his attention. It should be a win-win scenario if done properly. If the defender stays on his man, he can exploit the space and get behind the defence. 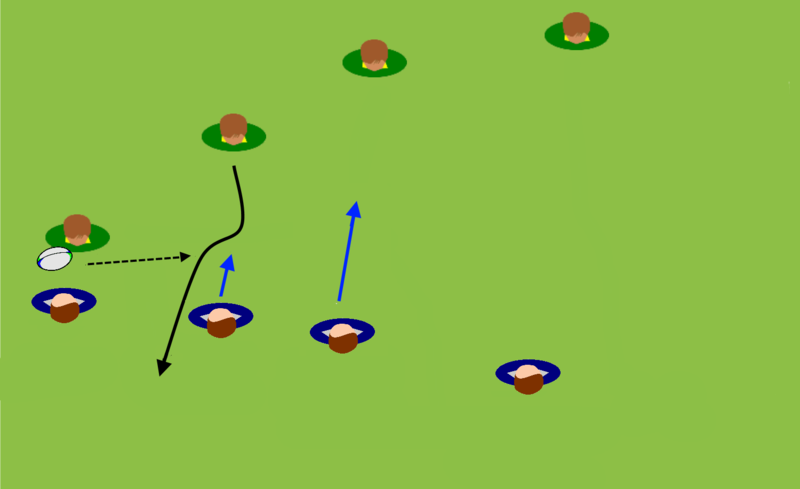 If the defender bites, he can pass to a supporting runner who picks a tight line behind the back of the turned defender. This is usually seen going out, but can also be done on the inside if there’s enough width. The third features a classic loop. Some people think the receiver should pop back to the passer on the inside – before she goes around – while others have the receiver pop when she’s gone around and is straightening up into the gap. I don’t mind either way, but think that each depends on how soon the receiver got the ball, how much space is in front, and what the passer intends to do when she gets the ball back. Some teams use the looping player as a decoy / distributor to pull even more defenders out of line. 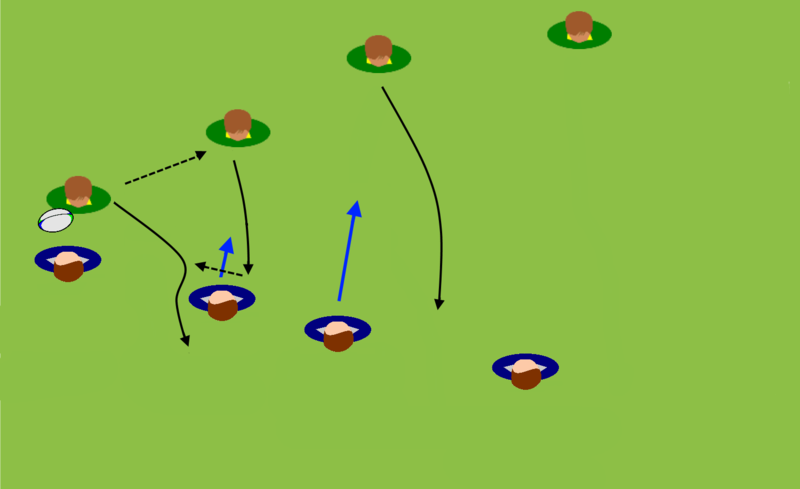 Other scenarios would have the looping player strike into an open gap between the second and third defenders. Ideally, the looping player would keep both options open! I might go into them in greater detail later, but you can combine both Unders and Overs lines together in what are called Blocker and Slider moves to really open well-disciplined defences, but I think at amateur levels, the above are usually quite effective. That said, the essential element of a complicated move is usually just one move – in a Slider, for example, the second attacker suddenly flares outward toward the third defender. If teams are truly ‘playing rugby’, they’ll assess what that does and simply pick the best way to attack the way the defence reacted to that move. In this second post focusing on simple ways to beat typical defensive styles, I’ll focus on the blitz defence. It’s also referred to as a ‘rush’ or an ‘umbrella’ but for the sake of simplicity I’m going to stick with ‘blitz’. This tactic is more recent in rugby’s history, and I’m led to believe it comes from rugby league. London Wasps used to be renowned for it when league legend Shaun Edwards was coach there. In this link from BT Sport’s Rugby Tonight, you can hear Edwards talk about it: [click here]. It does have quite a few limitations and it’s often referred to as a high-risk/high-reward tactic because it can stop teams deep behind the gain line or give them a huge opportunity to break out if not done properly. If outer defenders run too far forward, they give a great exit opportunity for the ball carrier. 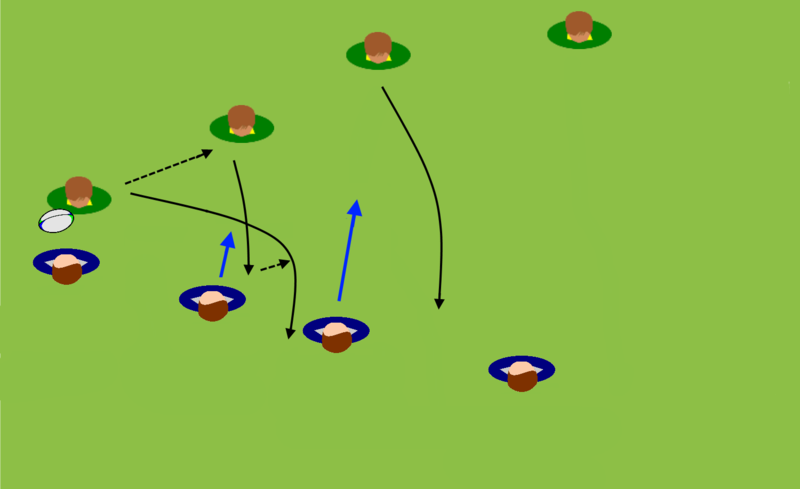 In the diagram, the passer dummies a pass hoping the outside defender sprints up to put a big hit on the receiver, but then slips behind with a sharp angle and a burst of speed. It’s key that the ball carrier run away from his/her defender and and behind the inside shoulder of the next defender. In some cases, that defender recognises this and is able to adjust. This defender is now out of the play allowing the player he was covering to sprint forward and go looking for an offload from the ball carrier. If the pass is made early and a defender “shoots up” ahead of the rest, there’s an opportunity to send someone else from either side in behind. In this situation, the support runner has to run a sharp line aiming for the space behind the defender and make a timely call for a sympathetic short pass. Similarly, when one “shooter” comes forward to cut off a pass or in an overzealous attempt to intercept, a patient passer can hold and pass behind the shooter to a strike runner coming up flat. As a blitz defence usually only involves a small section of defenders coming forward, there is an opportunity to go around the closing ‘gate’. The team using this option requires patience, quality execution and belief that they can play from deep (a tackle here can mean a costly turnover!). They have to hold their depth and make early and accurate passes with little forward running so they have time to get to the outside. It can be a less-risky option to take, however, if the players leading the blitz aren’t the most agile and if support is present to run into the holes created. 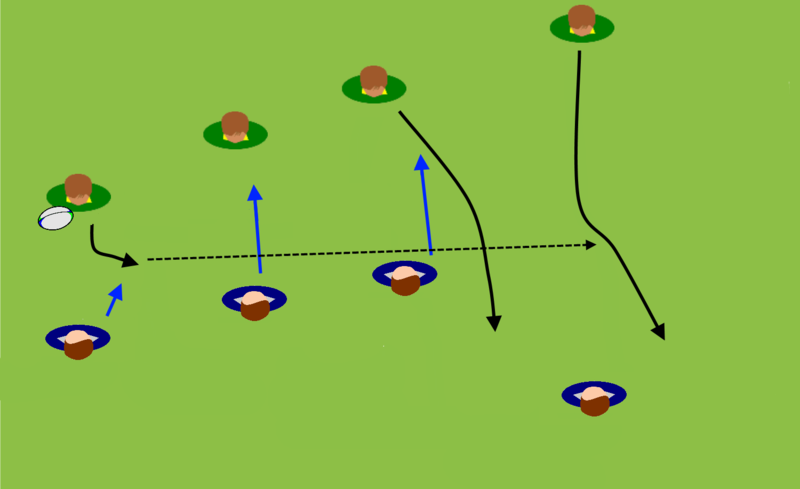 If the defending line is up fast and tight, there is still an option to pass (remember: the aim of a blitz is to contain the ball on the inside and contest from a powerful, go-forward position of strength behind the gain line). In many blitz defences, the wing holds back to cover a kick. If the passer has a good long pass, he/she can try lobbing a quick one to the winger coming up flat over-top the blitzing group. For reference, Quade Cooper often does this, but he has also thrown intercepts or set up the receiver for a big hit when the pass was floated too high, allowing time for a defender to get under. The group rushing forward often leaves a big gap between them and the full back, inviting a short kick behind for someone to re-gather. Although a lot of people hesitate to kick as one can be giving possession away, this tactic used more than once early in the game can also cause a blitzing team to ease off, not wanting to give away too much space behind. This is one of the reasons that teams use blitzes more as an occasional / situational tactic rather than a continuous style of defence. Another big part of developing analytical and clever decision makers is to put them in typical game-like scenarios and have them assess the visual cues that often appear. This means doing more than 2v1s because, while it’s essentially what breaking down defences comes to, there are so many variables in a line of defenders, that players have to consider a fuller range of options and possibilities. We always try and attack the ‘easy opportunity’ – things like mismatches in size, speed, or ability, poor alignment, obvious gaps, etc. Again, for teens this is often simple enough, because in our league there are always ‘exploitable opportunities’ like this. The men, however, are generally more organised, especially as defence is such a major (and easy) focus these days. So our scenarios therefore have focused on defensive styles and how to beat them based on the inherent limitations or opportunities in their structure (see below). In order to speed up the process of picking the right tool for the task at hand, we brainstormed ideas on how to beat each style and focused on just a few that fell within the team’s knowledge and abilities and which matched our preferred style of play. Below, and in subsequent posts, I’ll outline some of the ‘tools’ we use for different styles of defence, starting with the classic drift defence. As defenders push out, it’s difficult to adjust to someone changing directions against the flow of the push. This is a classic ‘attacking the branches of the tree, rather than the trunk’ moment. A tight line on the inside shoulder might just catch an arm. Too close to the inside defender, and the ball carrier might be caught. If the inside defender is a bit lazy, then there’s a huge opportunity. The trick here is that there has to be a reasonable gap between defenders. Again, aided by a lazy inside defender, but not impossible if the timing of the support run and pass is good. The support runner might also expose a different gap than noted below if the inside defender pushes too early onto the receiver, leaving an even bigger gap. If the defenders are disciplined, though, it’s really the space behind the ball carrier’s defender that needs to be attacked. As noted, drift defences tend to hang back on the outside hoping to force the attacking team toward or even into touch, often accommodating for a lack of numbers out wide. So a simple solution is to get the ball there as quickly as possible. The key element is to get the ball there quickly and relatively flat. If the pass is loopy and deep, the drift pushes out and comes up. Where it’s quick hands or a long and flat miss pass, the flatness of the strike runner will expose the space before the defenders have time to cover it. Drift defences are trying to buy time, so take it away. On the flip side, if the pass is a early, the attackers can preserve width the defenders are trying to close down by straightening up. 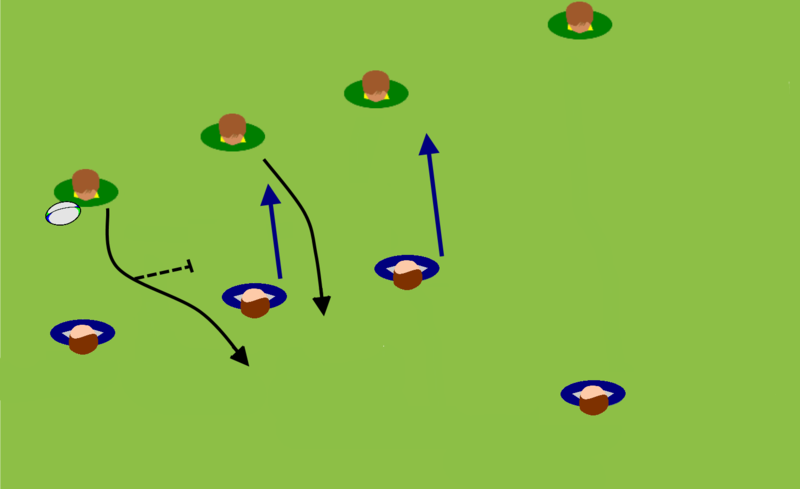 The looping run can be effective if the player looping around is actually quick and if the passer picks a line that effectively blocks the drifting defender. Timing is key here, as if the passer pops to the looping player too soon, s/he’ll likely get tackled from the side by the drifting defender. That said, if the passer recognises this happening, the passer can dummy, hold and go using the looper as a decoy. 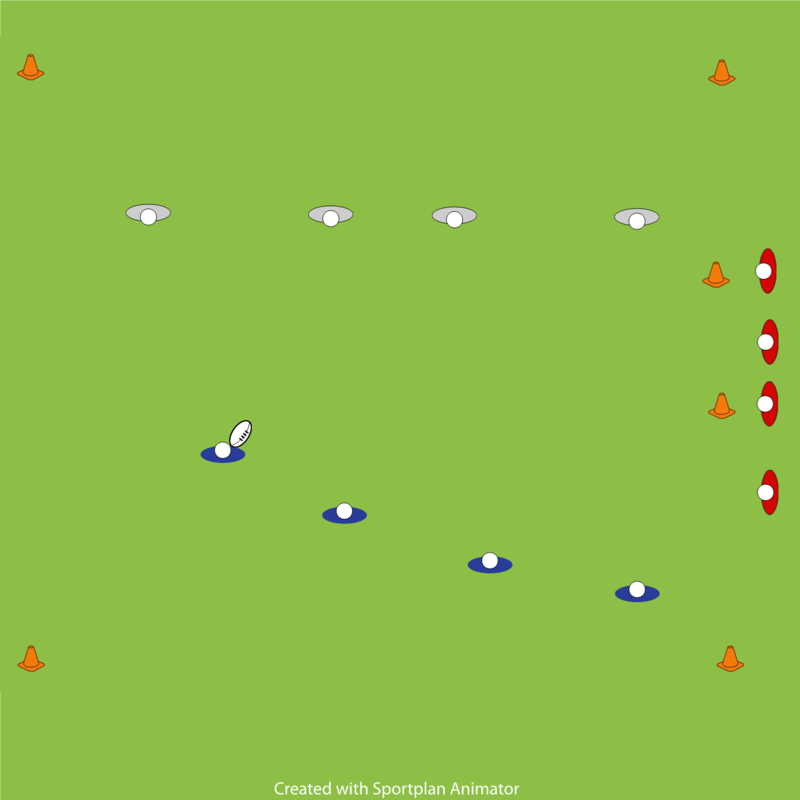 This situation is made easier for the looping runner if the third attacker moves wide, drawing the third defender. This would present one of those either/or situations that should be win-win … third defender stays on third attacker, and looper has a gap; third defender steps in on looper and s/he passes to the third attacker who should have a massive gap. Here’s a game I created that’s become popular with all three teams I’ve coached since I came up with it last year. Rapid Fire Touch is 4-handed – i.e. two different people to stop a ball carrier, after the first two-handed, the ball carrier can still run but can’t score. 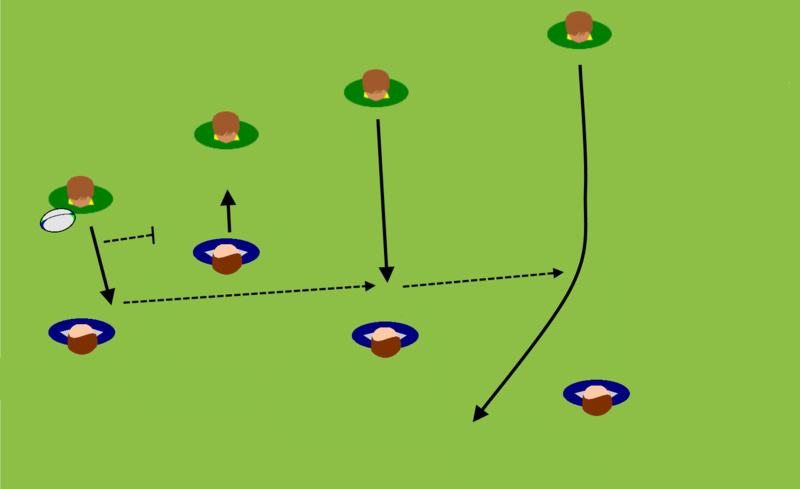 When scored upon, the defending team leaves the field of play immediately and the attacking team can attack the opposite goal line. All players from that team must cross the goal line before joining their team mates. 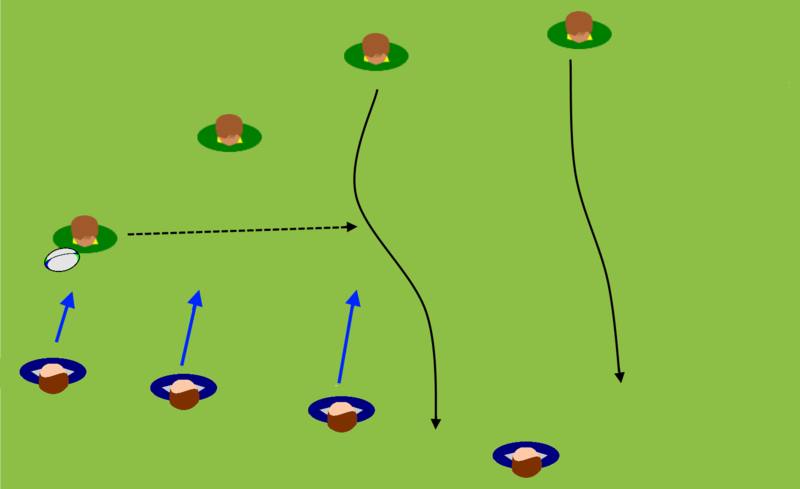 When touched by two different players, the team in possession leaves the field of play immediately and the defending team all must cross the nearest goal line before attacking in the opposite direction. 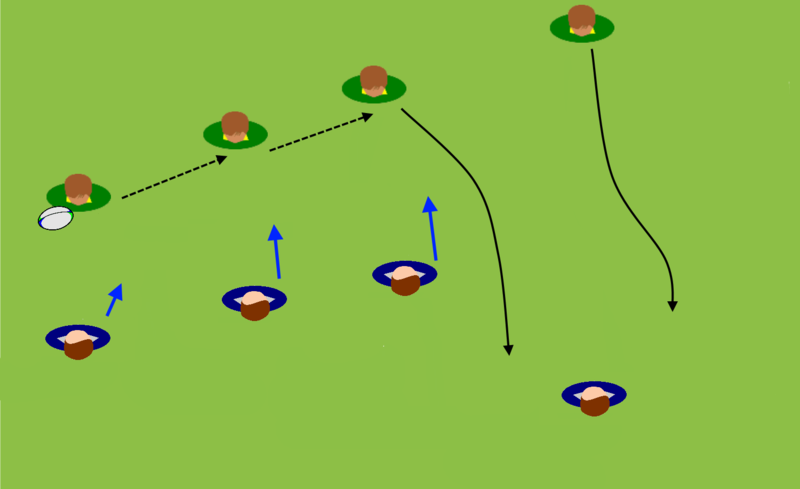 In both cases, the new team enters the field of play at midfield immediately, matching up and communicating their responsibilities. This game can be played with 3, 4, or 5 (find this to be the maximum to ensure everyone’s involved) per team. Four-handed touch encourages ball carriers to attack space and create full line-break or half-break scenarios. It’s main focus is evasive footwork, ball movement and support lines, not to mention communication in both attack and defence. The width of the playing area can vary. Wide encourages support lines and communication as ball carriers are more likely to make breaks or pull defenders well out of position (remembering that two defenders are needed to stop one from scoring). Narrower might be better for advanced players to work on timing of the pass and run and more challenging creation of space / opportunities. This works really well in a gym for winter training. Encourage to communicate early, pass to space, take on defenders with evasive footwork and supporting runners to be loud and pick clever pursuit lines. Faster the better as taking away space gives the opposition less time to adjust! Great for developing a fast, open style of play training communication, seeing and taking space, support and fitness as well. As a visual learner, I’ve always been interested in watching sport and trying new things (as a player) and adding to my knowledge (as a coach) from what I saw on the telly in addition to enjoying the spectacle. The wonders of the Inter Web have allowed me to expand upon this as I can watch way more sport than I can with even the best cable packages. Video clips on YouTube are an important learning tool for me as rugby’s a sport that does continue to evolve, both in the way athletes play the game and how coaches direct it. There isn’t a lot of great coaching material that gets published – compared to my first sports, American football and basketball anyway – and even tv analysis leaves me scratching my head at times as presenters can be full of hot air. So analysing video myself, looking at cause and effect over and over via the slide bar and watch again button, allow me to pick apart the action myself. There are plenty of great accounts on YouTube – with legal uploads too! – that you can observe and analyse to develop your knowledge of the game and to give you an idea of what to work on at practice. Kids love this stuff as well, and especially for those of us in countries where televised rugby is hard to watch, sending them here is not only a way of getting them more excited about the game, but also to learn what Clive Woodward called the ‘critical non-essentials’ of the game that are hard to train for – like quick lineouts, dummy passes, quick tap penalties, etc. Let’s look at the Aviva Premiership’s Try of the Week for round one of the new season. The try scored by Christian Wade is so much more than just his amazing step and speed. LESSON 1 – Attacking with purpose: As the announcer says, Quins were probing in attack but Wasps’ aggressive defence stopped them. Fly half Nick Evans runs sideways allowing centre Eliot Daly to take him down quickly in the tackle. Running sideways isn’t a complete sin in my book, but you’d better have an exit strategy because tackling someone from the side is much easier than from the front, and Daly dominates the tackle. One of the Quins backs needed to call for the ball, either wide, or on a switch to straighten up their attack. LESSON 3- Quick ball: It could have ended with a ruck and the scrum half moving to play the ball or a forward to pick and drive around the fringe of that ruck – as I see most teams do. The next key element before we see Wade’s brilliant feet in action is the lock not opting for the selfish / unthoughtful pick and drive, but the quickest of passes out to the players who had both space and a numbers advantage. At 0:08, we see #5 Marco Wentzel play the ball in a diving pass to what ends up being four backs against one. LESSON 4 – Defensive recognition and communication: Not only was winger George Lowe caught outnumbered, you can see that at 0:07 and 0:08 he’s not even taking notice that there are that many players outside him. Same goes for scrum half Danny Care, who should know better as an England player, that the tackle was lost and he should be directing traffic to shore up their defence. Lowe, as the last man in defence on the wing should have let that ruck go and positioned himself to not just cover Wade, but also call for help on the blind side. Instead he runs in, then has to run back out to cover Wade. Wentzel’s quick thinking pass sets the Wasps backs off, but better defence might have prevented them from such an easy run. LESSON 6 – Timing: The initial receiver is Wasps inside centre Andrea Masi. First off, he does a great job to get back on side into a position of depth that gives him space to not only run when he gets the ball but also time to think about what his options are. It’s not clear as to whether Wade calls for the pass or Masi sets him up, but either way the timing of it all was excellent. Masi takes it forward in two hands, which is key because it means Lowe can’t be sure as to whether he’ll crash it up – as inside centres are oft to do – or pass. If Masi had tucked it away, it’d have been easier for Lowe to commit to him as the pass wouldn’t be as likely. His forward run also serves to commit Lowe to a certain degree. If he’d passed immediately, Lowe could have slid off and immediately picked up Wade. LESSON 7 – Easy space: I tell me players to seek out ‘easy space’ as much as possible – clear room into which they can run. Space between defenders is obvious ‘easy space’. But important ‘easy space’ – especially when facing well organised defenders who aren’t allowing attackers to get into gaps – is also in between ball carrier and defender, i.e. the space in front. This importantly gives the ball carrier time to create or preserve space for someone else. And this is what Masi does so well. Masi, now without the ‘easy space’ in front, having drawn Lowe somewhat, gives a well placed pass to Wade and puts him into ‘easy space’ out wide. If Masi had selfishly cut into the ‘easy space’ out wide, Lowe would have drifted with him … possibly allowing Wade a switch back, but which would also make it easier for cross cover to take him out. Instead, he fixes Lowe in his channel, preserves the width for Wade and gives him the opportunity to use it with a well timed pass. LESSON 8 – Footwork: Christian Wade is fast, easily one of the fastest in the Premier League. But it’s not his straight line speed that gets him the try. George Lowe is also fast and Wade isn’t the largest or most powerful of players so a well timed pursuit might stop him. Wade brilliantly makes a subtle change of direction to run at Lowe, and then quickly swerves away and beats him to the outside. Lowe’s reaction shows fear that Wade will beat him on his inside – though I’d say his positioning to stop that was pretty good – and as such he hesitates and nearly stands up. Wade effectively ‘freezes’ or ‘fixes’ him in place and makes his real move. If Lowe had backed himself, and committed to the pursuit and tackle, I think he might have at least got a hand to him. Instead, by being hesitant and falling for the feint side step, he lost his momentum and his ability to close down the space and make a tackle on Wade. There is is. A one minute clip that can be broken down into many teachable elements. Watching game tape can be tedious and boring for the players, esp. at school level where most are out for fun. The aforementioned high school team interestingly enough all chose to talk about tries that matched how they liked to play on the field. We never watched our own games, but I’d look for trends in the few that were filmed and by consulting my own notes and we’d work on those elements at practice – both ones that needed reinforcement and those that needed correction. We did analyse our own game tape when I coached at a university, but there we only addressed major trends. So I’d pick out two or three things we did well and two or three major things that needed work and we’d break those down as above as a highlight / reminder and make those elements the focus for training the following week. I think involving the players in the discussion by asking questions rather than giving answers, making the whole process a constructive rather than instructive one, is most important. The university women demonstrated this in their desire to discuss those few clips and act upon the lessons, commenting that they felt these sessions much more productive than the ones their friends on the football team had to endure where they’d watch the entire game and break down every little element – if they managed to stay awake! I may have made reference before to a high school girls’ team I once coached to a city championship title. I’m indebted to them not just for memorable season, but also for having the will to try some unorthodox strategies I had that I was sure would work for novice players. I’ll talk more about our attack strategy soon as I finalise a clear way of describing and visualising it. It all came about when someone asked what plays I wanted them to run. As someone quickly suggested what they’d run last year I interrupted her because one of the first was the classic fly half / centre switch. I was maybe a bit blunt in saying so, but on the spot I declared that we wouldn’t have any “plays” this year. Needless to say, the girls were speechless. I am thankful, though, that there weren’t immediate protests and not even sideways glances (that I noticed, anyway) to suggest ‘this guy is crazy’. I quickly explained myself, though, saying that we can waste a lot of training time working on set moves that we might use once, maybe two or three times a game … or over use them to the point that teams have us figured out. I also stressed that the rigid “plays” teams run – especially at such a novice level – often cause players to miss the obvious opportunities given to them by defenders who aren’t absolutely perfect at defending in line and with quality. But let’s turn to the suggestion that prompted my almost-brusque outburst. The word ‘switch’ made me cringe as I disagree with the way it is used in seemingly nine times out of ten. With that team, I talked about the simple two or three-player moves that should not be called as “plays” but should happen on the fly to create space. A switch is one of those. To be used not as a set play, but as a move to be used on the fly to create space or expose poor defenders. The point of the switch should be to draw the defender marking the ball carrier with a sharp outward cut, allowing a strike runner to a cut back into the space created. Where space isn’t that obvious, players should look to expose what some coaches (citation pending when I remember where I read /heard that phrase!) refer to as the ‘soft shoulder’. The player switching back shouldn’t be running straight into a drifting defender, but off that player’s inside shoulder. With their hips turned in pursuit of the ball carrier who initiated the switch, it’s very hard, if not impossible for that player to make a tackle on his or her inside, or soft shoulder. Nine times out of ten, however, I see the switch being used on first phase, close to the mass of defenders around the ruck where it’s nearly impossible for the ball carrier to avoid running into someone. Some coaches would probably argue that their purpose is to set up a ruck and draw defenders inward for the next phase. I think this is negative rugby, contrary to the principles of going forward and maintaining continuity. I’d also counter argue by asking, first, did you not have the ability to attack with more ambition on the first phase? Lastly, I’d point out that regardless of the ability of your players, there are more clever ways of actually making and breaking the gain line than by running back into the mass of defenders. 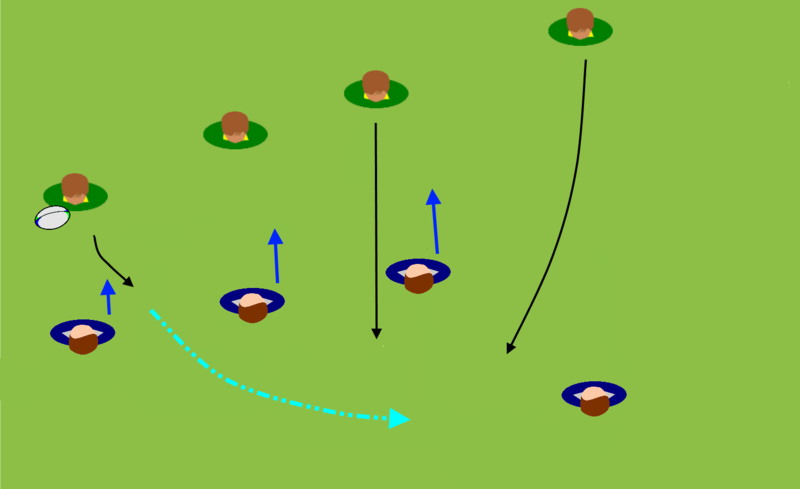 Some also use the dummy switch, whereby the ball carrier holds and goes himself or passes to a player outside, hoping to draw defenders in on the decoy runner. This was quite effective for great ball carriers like Stephen Larkham and Matt Giteau when they played for the Brumbies and Wallabies. The difference between the way they executed it and how most others use the dummy switch is simply down to the angle. Most dummy switches I see have the ball carrier running nearly sideways across the field in order to ‘sell’ the dummy by pretending to do the motion of the pass. First off, the angle all but eliminates the ball carrier as a true attacking threat as they’re not really going forward looking for space – most dummy switches are seemingly meant to fake inside and pass outside to, say, the outside centre or full back. Most teams choose one of the best attacking players as their fly half, so why take him/her out of the equation by making them run across the field? Secondly, the act of faking the pass – pulling the ball to the other side of the body and twisting the shoulders around – not only wastes time, in my opinion, but makes it hard to make a proper pass outward if that’s the intent of the move. A player cutting on a good 45 degree angle to his right will have his hands positioned to make a left handed pass. The act of faking the switch pass brings the ball to his right side. In order to allow the body to provide power and accuracy, the left handed pass is still the ideal, so the ball has to be brought all the way back to the left side and then passed. This wastes precious time. Very often, I see players – who are now under a lot of pressure – using the hand of the side to which the dummy was made (the right hand in our example). Even if that happens to be the player’s strongest hand, it’s an odd angle to make a pass and sometimes has the tendency to drift forward. At the very least, it again means that the ball carrier is no longer a threat as he’s nearly turned his back to the defence. If a dummy switch is going to be executed well, the ball carrier must take a sharp angle, aiming for the inside shoulder of the next defender outside him (generally speaking). It’s up to the decoy runner, therefore, to be loud and look as though he’s actually getting a pass. I feel there’s no need for the fake pass if the decoy is the one doing the ‘selling’. When a ball carrier, with a team mate outside her, has tried to make an outside break and is getting close to the touchline. The player outside her switches back in to keep the ball in-field, looking to get on the inside of a defender who’s pushing across too hard. This is highly likely if the ball has moved wide quickly as defenders tend to over-pursue those attacks by running sideways across the field. The receiving player might now find herself in daylight. Defenders will still be pushing across, however, and so I’d like to see support players get on either side of her as options for another pass. In broken play, after: 1. Several phases, 2. With quickly recycled ball, and 3. Away from the last tackle contest and the mass of defenders. Not much different than the scenario above, but where that can happen when the ball is moved wide quickly from a scrum or lineout, this one doesn’t necessarily need as much room to work. The three conditions provide the attacking team with that ideal opportunity when the defenders are jumbled (esp. when slower forwards get mixed in with backs), when they are disorganised, and where there is space to attack. Space can often be limited, so the focus isn’t so much about beating the soft shoulder as it is catching a defender off-guard who’s either pushed across too hard or who hasn’t pushed across enough.